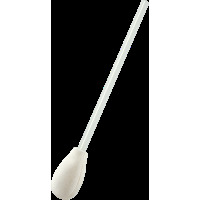 The ChloraPrep swabstick promotes aseptic surgical skin prep technique prior to surgery. The easy-to-use foam tip is saturated with the clear ChloraPrep solution.ChloraPrep Swabstick -1.75 mL Applicator (Single): 260100 5.25 mL Applicator (Triple): 260103 - Numerous clinical studies and evidence-based guidelines support preoperative and pre-injection skin preparation. 2% chlorhexidine gluconate (CHG) and 70% isopropyl alcohol (IPA). Rapid acting: ChloraPrep exhibits better immediate antimicrobial activity than povidone iodine alone. Persistent: ChloraPrep skin antiseptic maintains antimicrobial activity for at least 48 hours.2 Free iodine, the active ingredient in povidone iodine and other iodophors, has minimal residual activity. Friction scrub: ChloraPrep applicators promote gentle friction scrub to help the solution penetrate the first five layers of the stratum corneum, where 80% of skin-dwelling microorganisms reside. For the preparation of the patient's skin prior to surgery or injection. (Single). Do not use with electrocautery. Do not allow the solution to pool. Remove wet materials from the prep area. 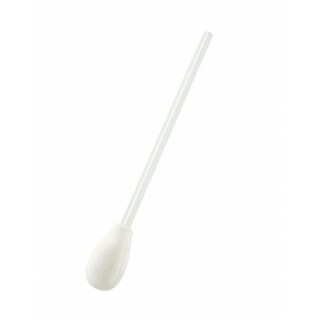 Discard the applicator after a single use. Note that the applicator is latex-free and for external use. Do not use for lumbar puncture or in contact with the meninges. Do not use on open wounds or as a general skin cleanser. Do not use on patients with known allergies to CHG or IPA. Keep the solution out of the eyes, ears and mouth. Store between 15 to 30 C (59 to 86 F). Avoid freezing and excessive heat above 40 C (104 F). Store within the recommended conditions to maintain the efficacy. 1. What is ChloraPrep preoperative skin preparation? A rapid-acting and persistent preoperative skin preparation. Its proven formulation is available in six unique applicators designed for procedures ranging from peripheral IV insertion to major surgery. 2. What are the active ingredients of ChloraPrep preoperative skin preparation? Chlorhexidine gluconate (CHG) 2% w/v and isopropyl alcohol (IPA) 70% v/v. 3. Is ChloraPrep preoperative skin preparation FDA approved? Yes. After submitting a new drug application (NDA) to the Food and Drug Administration (FDA), ChloraPrep preoperative skin preparation received FDA approval in 2000. 4. Which CDC guidelines recommend the use of a 2% chlorhexidine solution for skin antisepsis? ChloraPrep preoperative skin preparation meets the Centers for Disease Control and Prevention (CDC) Guidelines for the Prevention of Intravascular Catheter-Related Infections, published in 2002. The guidelines state to "clean skin with a > 0.5% chlorhexidine preparation with alcohol before central venous catheter and peripheral arterial catheter." 5. What category of CDC recommendations does 2% CHG receive?